“The Hamptons.” These two words conjure up images of successful people living in spectacular homes on beautiful beaches. The allure for all things on the East End of Long Island never seems to fade. In fact, the rate at which new homes in the Hamptons have been built each year has grown exponentially. Naturally, with the increase in new homes, the demand for interior designers has intensified. There are so many design firms to choose from that it’s hard to know where to start when selecting the right firm to outfit your haute but comfortable Hamptons home. Social Life went on the hunt to find our readers an outstanding interior and landscape design team on the East End. We had certain criteria in mind. We looked for a sophisticated yet cutting-edge approach to design that struck a perfect balance between functionality and imagination. Through research and outreach to the Hamptons building community, we discovered the boutique firm D+J Concepts. This firm’s designs are impeccable, artfully transforming ordinary spaces into classic modern styles. The designers marry understated and luxe in a way that stands apart, even among known firms out East. And, they custom design the furniture from scratch (all made in the U.S.). You tell them what you want, and, voila, they create it. Because the pieces don’t bear designer brand names, the prices can’t be beat. It seriously doesn’t get better than this. You may have heard of, or even seen, some of the work by D+J Concepts. 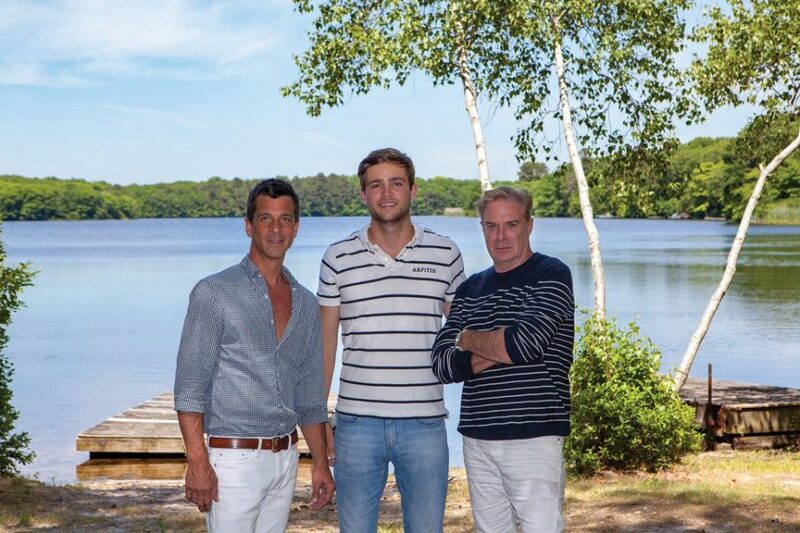 They scored the exclusive staging contract with Farrell Building, the luxury home builders based in the Hamptons. So far they’ve staged approximately 30 homes across the East End — from Westhampton to Montauk. David Hornung, the president of D+J Concepts explains, “One of the most rewarding experiences of my career has been working alongside Joe and Kristen Farrell, staging all their homes for the past two and a half years. They have taught us to balance elegance, quality, and customer satisfaction, all while staying within budget.” Hornung describes his signature design as a “modern transitional style that incorporates antiques and modern elements for an unexpected edge.” Bingo! Exactly what we’re looking for. D+J’s process is thorough and personalized. It kicks off with a comprehensive consultation on your proposed project. Your lifestyle, design style, desires, and budget are captured in a master plan that maps out options, timelines, and costs. “Only until you’re thrilled with the design package we deliver will we move on to the next phase,” explains Hornung. Even after completing a project, D+J will continue to work on your behalf to insure moving into your new space is seamless and comfortable. Now that’s customer service. It’s no surprise that D+J Concepts is active in posh locales like the Hamptons, Palm Beach, and New York.